Black Submarine have announced their debut album 'New Shores', which will be released on 3rd February via Kobalt Music, with a free track 'Black Submarine' available to download now from the band's website. 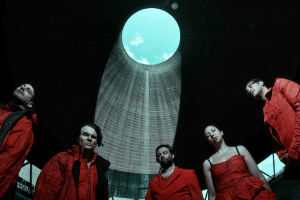 Black Submarine are Nick McCabe (ex-The Verve guitarist), Simon Jones (ex-The Verve bassist), Davide Rossi (multi-instrumentalist/string arranger for Goldfrapp/Coldplay), Michele 'Mig' Schillace (ex-drummer for Portishead/Santa Cruz) and Bristol-based vocalist Amelia Tucker. Black Submarine began in 2008, after Nick McCabe and Simon Jones asked Davide Rossi to provide string parts for The Verve's 'Forth'. Striking a common vein of pop sensibility and grandeur, the three continued to share inspiration as Rossi came out on tour with the band. The trio enlisted Michele 'Mig' Schillace, a longtime friend, and flew to Denmark to record in 2009. Back in the UK, Schillace had been managing Bristolian singer Amelia Tucker, who was an unexpected compliment to Rossi's vocals, and blown away by her voice, incorporated Tucker as a fulltime member. After originally releasing their 'Kurofune EP' as Black Ships in 2011, the five passed ideas between their home set ups, with Tucker working into the material the band had generated in Denmark and a year later, they reconvened in McCabe's South London studio. Mixed by Jim Spencer (Robert Wyatt, Echo & The Bunnymen, Factory Floor, Oasis), Black Submarine's debut is an 11-track record of spaced-out vocals, deep beats, rolling bass-lines, molten soundscapes, meditative chord sequences and explosive string-arrangements. Sounding like the nether-space between early morning and daybreak, these songs are a transformation of the music that surrounded each member in their early careers, made relevant again by the hybrid of today's contemporary sound. A track from the album 'Black Submarine' is available to download now as a preview to the album. Black Submarine will be bringing 'New Shores' to a live audience in February with two exclusive UK headline shows. Tickets go on sale at 9am on Friday 25th October priced at £17.50 in Manchester and £20 in London and are available from Gigs and Tours.